Great Sun, Dark Planet & Earth Crop Circle. GALACTIC FEDERATION OF LIGHT SOCIETY. Namaste and welcome to this Crop Circle page. I send much love and blessings to you always. This message of the crop circle is much deeper than it looks. I will allow HALISARIUS to come through for you with the message as it is important for all of us to understand the Star Messages especially at this time. A KOMO HA HALIMA, Greetings, I AM HALISARIUS, PLEIADIAN CHIEF LEADER, PLEIADIAN CHIEF COMMANDER and I AM CHIEF LEADER OF THE GALACTIC FEDERATION OF LIGHT SOCIETY. As a Star Commander I have seen much within the universal plays, and I welcome you to the time of the rising consciousness, when you are fulfilling the greatest prophesy in the universal game, of the light rising and the darkness having to see the light and then having to return to the light. We as your Star Brothers and Star Sisters wish to welcome you to the times we call, the Great Awakening Consciousness, The Time of the Restoration when all will become balanced once again to allow greater evolution within the higher love universes to happen. As a Star Chief Commander I wish to bring you this information and am grateful for your visit to this page as it allows you to understand another perspective to the universe. Are we real? Do you have star brothers and star sisters? We exist on other dimensions other than your earth plane. Our bodies are different than yours. We have different technology than yours. We can hear you and understand what is happening upon your plane via waves, similar to what you call radio waves. We are watching your planet during the awakening time and we see who desires to hear the greatest stories ever told, and who is fast asleep within their world. You are involved in the greatest story ever, and to us it is more than a story though it is an illusion and a game. Your game, the way you play it, depends on how fast evolution will move ahead in the future on a higher level, as all reflects each other, and now the Great CAEAYARON is calling you to help you become activated, which to us as star beings in the great love are the most important healings that can take place within the universal arrangement, as when you become activated, so do certain codes within higher universes, and then we can work towards becoming the greater oneness in the collective universe of love. This message you see in the image is important to us. We wonder what you see in the message? Yes, you see a sun. Do you think it is a literal sun, or a symbolic sun? You see another circle. Do you think it is the moon, and then the circle within the darker circle, what is it? This image symbolizes many aspects of the universal game. We like to show our views and perspectives in different ways, and the messages always go very deep. In a few years time, we will review some of these messages again with you once again, on a much deeper level as your current understanding is growing, and with the growth we can build your knowledge. You are living in a world that is an illusion. We know you have heard this before. It stands for the choice. The choice of darkness and light. Behind the small circle, which represents your earth, you have the larger circle of darkness, and behind the darkness you have the great sun light. Your opportunity to see both the darkness and the light is your choice to see. You may think it is easy to see both, but it is not all what it seems as the darkness will say that the light is darkness, and the light will say that the darkness is darkness, and hence it is up to you to choose and to find. We often call this choice and the way of the search for the greater healing path, the large maze and the dimensional corridors. 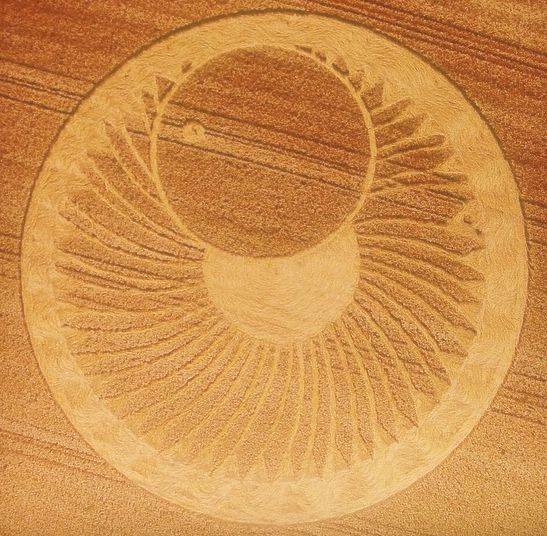 You will also see this in some of our messages within the images to you, which you call crop circles. You are living in a time when you will decide which to choose from. We, as higher star beings in the love are in the light, the bright light, and we constantly seek to further our knowledge and our love for the great light because it is inner love, greater power for us and a closer connection with the Great Divine Light, also depicted by the Sunlight. Here your planet is shown as the small circle and you see the size of the darkness in comparison. The darkness certainly built up its great power, and if you look behind it, you will see the sun, the Great Sun Consciousness shining. The darkness does not even compare to the size of the Great Sun, though it believed it could become greater than the Great Sun Consciousness. Hence it sought power to become that. Because many universes were destroyed as the darkness sought that power, all needed to happen upon your earth game to see if your light within you would be stronger than the darkness. The darkness created much fear into your planet, creating programmes of darkness within you in the hope to stop you from seeing the Great Light Consciousness rising, to stop you from awakening to the light programmes within you, which you all have within you. The greater the people upon your earth desire the Great Sun Consciousness to happen, the faster the darkness will be removed, as the darkness is also within the people. The darkness can not stay within the people’s programmes once the Great Light becomes stronger upon your earth as the people will begin to remember who they truly are and they will desire to return to the Great Sun where we are all from and are working towards to become stronger beings in the love consciousness. The greater your evolution is, the greater we feel the Great Sun within us also, and to us there is nothing more beautiful as we feel the love within us constantly. Please do not think that you will lose your individuality when you evolve upwards into the Great Light. We have greater personalities and individualities than you have dear ones, and we, as Star People enjoy life on many dimensions and we travel to many planets to further our ‘education’ of our ‘evolution,’ and to us there is no other greater joy. We ask you, do you desire to return to the Greatness of the Stars, for this is where you also come from. Do you remember we wonder. We certainly hope we are helping you remember who you truly are, as then the Light will be desired by you. The Great Sun Consciousness is the Consciousness of Great Divine Love, and it was prophesied a long time ago upon your plane that the Light would rise upon your plane so brightly that it would be confusing to many. This is certainly true. As the darkness can no longer hide you from the Great Sun, the Great Sun is rising upon your earth, and because the people upon your plane have forgotten the Great Sun Consciousness, the Great Light can be confusing to the people. Also this message has another meaning. This is a meaning of your ancient history. The Planet in the darkness, is illustrating here how small your earth is compared to it. Your earth, originally, came from the Dark Planet as the game of the Light and the Dark needed to be played on your planet to see if you would desire the Light within your heart once again as many universes had fallen from the Great Love. This is why, because your planet was a part of the Dark Planet, you could be programmed by the Darkness and the Light, as the Dark Planet was once called the Blue Planet, the planet where all creation came from. The greatest secrets were stored within that blue planet. It was a planet where all DNA could be created and all illusions could be created. The darkness desired the great planet as it believed it could find the way into the Greater Sun with all its power and then begin to rule the Sovereign Universe. It believed it could create its own creation by taking over the planet and create its own secret dimensions. Because it succeeded to destroy much within the universe, an arrangement was made between Divine Agreement and the Great Galactic Universal Federations and Courts, that part of the dark planet would need to come back to the light, to create light within the universe again, and that the planet would need to come back to the light beings. How that would happen, at that time of that arrangement, would be a complicated task. The three Light Grid Programmers went to that large dark planet and placed light within it. They later also placed much light within the earth, with the Great CAEAYARON, and this was the way the Lemurians received their Light Codes so that each of them would have enough light within them once again to return to the higher love dimension of star existence, and also recreate, or resurrect, their universes who had been lost by the darkness. This was the only way to return to the love dimensions. The dark beings, the dark inhabitants of that planet, the ones filled with anger, did not desire the love and the light of the Light Grid Programmers, and in their anger, destroyed much of their own planet, and your planet was thrown out to the depth of the universe ready for the game to be played. Hence your planet to us is called a treasure and the greatest jewel of the universe as all secrets lie within it. We, as the great Star Beings in the great love, and I, HALISARIUS, CHIEF COMMANDER, also invite you to the great activations with CAEAYARON, to the Divine Pineal Gland Activations happening at this time upon your earth with his Light Grid Programmer and my channel also, Suzanna Maria Emmanuel, as then you are able to return to the Great Love of the Universe, together with us, in the Galactic Family of Light where we all dwell in our love together. A Komo Ha Halima, greetings, I AM HALISARIUS, CHIEF LEADER OF THE PLEIADIANS AND CHIEF LEADER OF THE GALACTIC FEDERATION OF LIGHT SOCIETY. ⭐Sun: Showing the Great Divine Light within the universe. It is returning upon our planet at this time to awaken us from our deep spiritual state. ⭐The large dark circle: a) Shows the Dark Planet b) Shows how hidden our planet was from the Great Light c) Shows its size compared to our planet, and the Great Sun. ⭐The little white circle within the large dark circle: a) Shows our planet earth b) also shows the close connection of the dark planet and our earth as it shows how related the two planets are by the dark spot within our planet c) By the Light within our earth, it also shows how our planet comes from a planet from the light dimensions originally which was taken over by the darkness as a trophy as the original planet was a planet of creation. ⭐Extra notes: The Light Sun rotates constantly (also seen in the image) and gives power. The dark beings could not reach the light of the sun for their own power and needed human consciousness to access the power from the sun as our consciousness is able to reach the light more than they can. They stored this power in grids and used it for their own technology etc. ⭐The two dots in the sun, like sun spots, demonstrates the amount these beings could take from the Light Sun with the human consciousness. As you can see it was not much compared to the overall area. Please note that CAEAYARON has spoken about the darkness needing to surrender now because of the great healings taking place at this time, so they are needing to come into the love and the light in their own time.